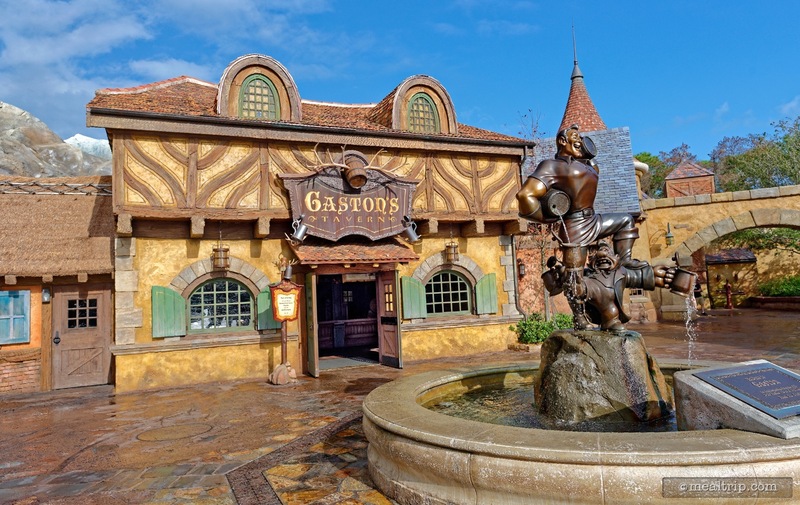 Gaston's Tavern takes it’s design cues from a mid 1750's French countryside tavern referred to in Beauty and the Beast. The interior and exterior of the building are quite immersing and detailed. There are a few seats outside, but most tables are inside the building itself. While not large, the interior feels very quaint (and dark), if it's not overburdened with guests. This counter service's limited menu offers beef stew, vegetables cups, hummus with chips, fruit cups and warm cinnamon rolls. This is also where you can pick up a “LeFou's Brew”, a frozen beverage containing frozen apple juice flavored with marshmallow, and topped by a creamy, passion-fruit froth. I stopped by Gaston's Tavern recently to try the new "Tavern Beef Stew", which replaced a guest favorite, the "Roasted Pork Shank". Some would consider this a big shift in the menu, but only because there are only a few things on the menu to begin with. The only other noteworthy menu items would be the giant "Warm Cinnamon Roll" (which I'm sure we'll get to in another review) and LeFou's Brew (a beverage that combines frozen apple juice and toasted marshmallow flavoring with passion fruit-mango foam) which all tastes better than it sounds. Sure, there are still fruit cups, apples, and a chocolate croissant... but the brew, the stew, and the bun are the big three. 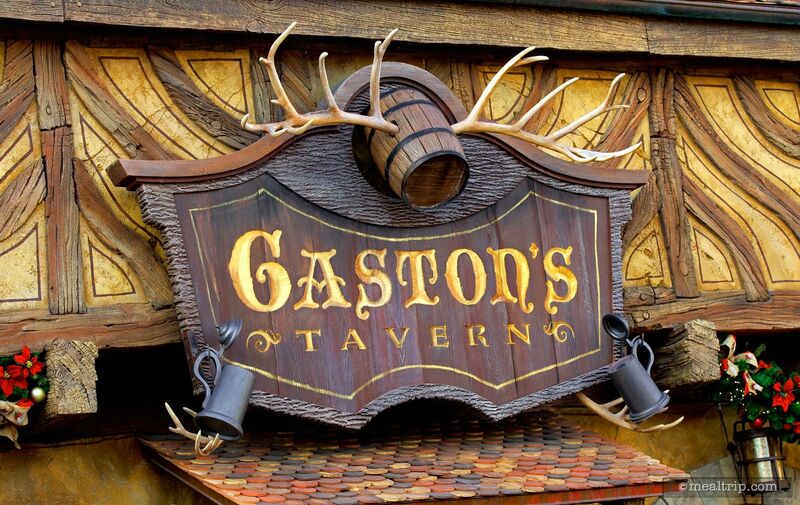 First though, let's talk about Gaston's Tavern itself. The interior is a fairly well (faux) detailed 18th century, French countryside tavern, and would be a quaint space to relax in… if you were the only people in the building. Since that never happens, the small dark interior is often packed full of guests that have to hover around in the hopes of grabbing a table as other parties are leaving. The limited seating capacity of 24 "no back support" wooden stools seems intended to discourage lengthy stays at the tavern. If you think about Gaston's Tavern as a "Counter Service Restaurant" (which Disney seems to in their own marking efforts), there's not really enough seating or space to move around in. 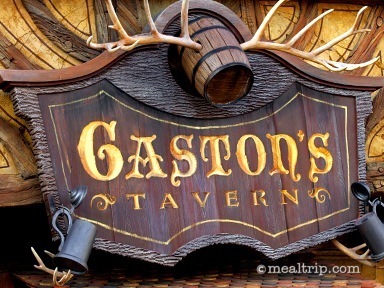 Being a glass-half-full kind of person, I consider Gaston's Tavern to be a "Food Cart"… in which case, the air-conditioned space seems extravagant by comparison. The service… is fine for an extravagant food cart but is not generally what I would consider "fast"… i.e., with only a handful of option-less items on the menu, money and food should be flying around like Mrs. Potts and Chip with a full tank of dark roast. Surprisingly, even with just one person in line before me, it took around 8 minutes to pay for and receive a single order of stew. So if you see 10 people in line, well… you can do the math, but you might spend less time cueing up for a ride of the Seven Dwarfs Mine Train. The stew itself is great looking, and I'm happy to report, great tasting as well. Somewhere around $10 seems to be the new price point for a per-person counter service meal at the Disney parks (circa late 2015, not including a drink of course) and with that in mind… the Tavern Stew actually seems to be a decent value. There is a bit more food in the medium-shallow bowl than there is at some other counter service locations we've recently visited. There is a good amount of the beef in the beef stew, along with some "very" al dente carrots, some al-normal potatoes, a few chives tossed in for color and a half a clunk of "French bread" (ummmmm... more like a half a clunk of a French bread shaped dinner roll, but that was probably the right way to go, lest there be crumbs and flanks of crunchy bread all over the place). There was only one half spoonful of pillow fat in my whole dish, so it's a fairly lean beef stew. In all honesty… I'm sort of glad that tiny amount of fat was in there. It helped make the dish seem more real and genuine than the can-o-soup that I feared it might be. By all accounts, an even and mildly spiced beef stew that I would totally order if it were on the menu at the nearby Be Our Guest restaurant… it is just that good. 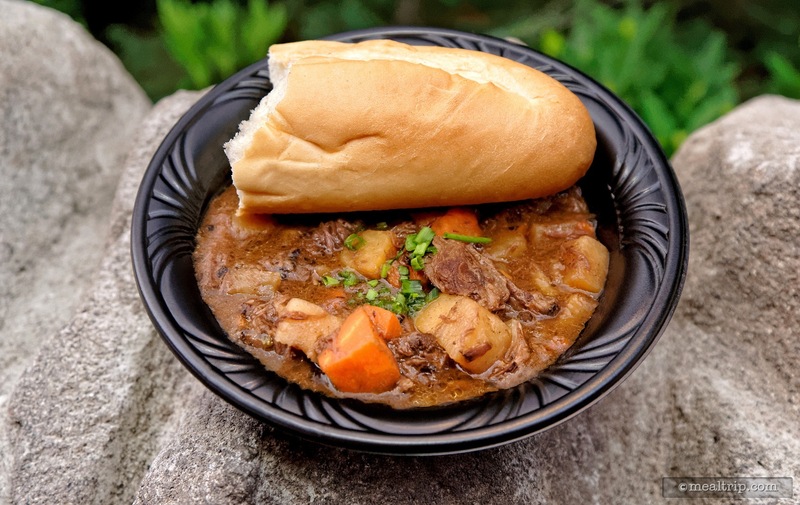 What we're not sure of at this point though, is if the Tavern Beef Stew will be available just in the "winter months" or if it's a long-term item at Gaston's. A couple of smaller kiosk and walk-up type windows here at the Magic Kingdom and at Animal Kingdom seem to keep dishes around for six to eight months, and then change up the menu slightly. 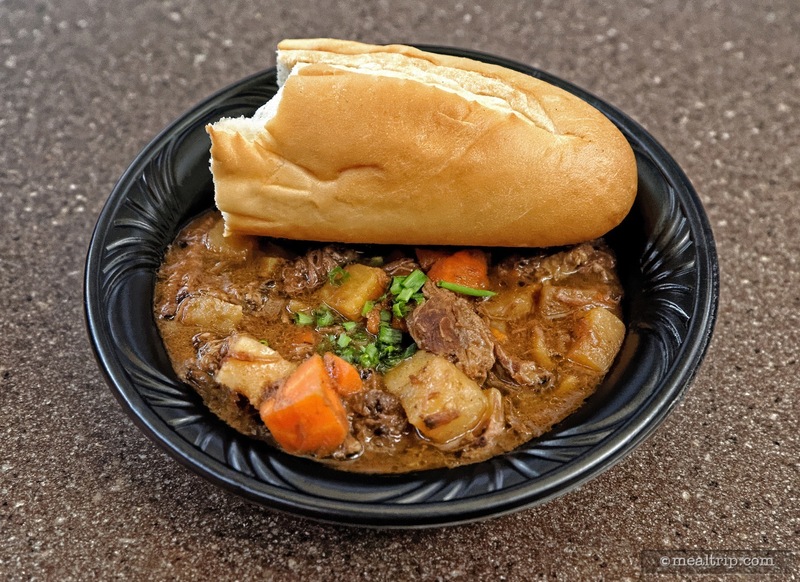 Only time (and sales most probably) will tell for sure… but if you're in the neighborhood of the New Fantasyland… and especially if it's actually a colder day or evening (that would be anything under 75°F or 24°C around here)... Gaston's Tavern "Tavern Beef Stew" is definitely worth a try! It's one of the better counter service options we've come across recently.